Keep your waste secure and out of reach from kids and pets with the simplehuman Black Plastic Slim Step-On Trash Can. Featuring a slow and silent close, this hands-free design is easy to operate with a sturdy foot pedal and includes a lid lock that prevents animals and children from getting into the trash. For longer chores, a stay-open feature keeps the lid fully open, while two wheels enable you to move the can wherever you need it. Honey-Can-Do TRS-02075 Steel Step Trash Can, Robin's Egg Blue. A contemporary and colourful addition to any home or office, this 30L trash can boasts sturdy construction for daily use. Perfect for brightening up the kitchen, laundry room, or office. The steel foot pedal provides hands-free operation to keep germs at bay. A removable inner bucket keeps bags from snagging and is easily cleanable. The bright blue, hand print resistant exterior is easy to clean and features a plastic fold down carrying handle. Honey-Can-Do TRS-02070 2-Tone Colored Step Trash Can, Gray. A contemporary addition to any home or office, this 30L trash can boasts sturdy construction for daily use. The steel foot pedal provides hands-free operation to keep germs at bay. A removable inner bucket keeps bags from snagging and is easily cleanable. The deep recessed lid, hides trash bags from view. The gray, hand print resistant exterior is easy to clean and features a plastic fold down carrying handle. Honey-Can-Do TRS-02112 2-Tone Stainless Steel Step Trash Can. A contemporary addition to any home or office, this 30L trash can boasts sturdy construction for daily use. The steel foot pedal provides hands-free operation to keep germs at bay. A removable inner bucket keeps bags from snagging and is easily cleanable. The deep recessed lid, hides trash bags from view. The hand print resistant exterior is easy to clean and features a plastic fold down carrying handle. Introducing the worlds first fingerprint-proof stainless steel trash can controlled by step-sensors. With a light tap of your foot, the lid magically opens wide enough to throw away even larger debris than normal home trash bins usually allow you to. The three sensor plates provide convenience with one located in the front of the can, and one on each side of the can, as opposed to a one sided step pedal on a conventional step on trash can. They are also detachable, allowing you to place the trash can in any corner of your home or office. Not only does this trash can provide ease and convenience, it is also low maintenance. The trash can exterior is topped with a fingerprint-proof coating from the top to the canister; provides easy cleaning surface that repels dust, dirt and fingerprint. Most importantly, by eliminating the need to manually lift open the lid, it will save you energy and prevent the spread of germ contamination. 40 L Black Plastic Slim Step-On Trash Can Keep your waste secure and out of reach from kids and pets with the simplehuman Black Plastic Slim Step-On Trash Can. Featuring a slow and silent close, this hands-free design is easy to operate with a sturdy foot pedal and includes a lid lock that prevents animals and children from getting into the trash. For longer chores, a stay-open feature keeps the lid fully open, while two wheels enable you to move the can wherever you need it. 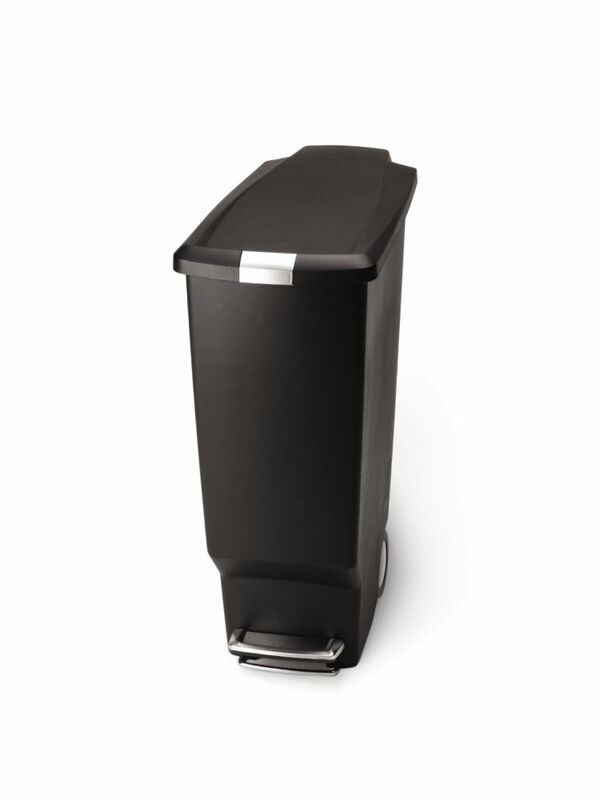 40 L Black Plastic Slim Step-On Trash Can is rated 4.1 out of 5 by 44. Rated 4 out of 5 by Allie from The can is great! I've had mine for 5 years, but I do have one beef. Once that lid comes off, it ... The can is great! I've had mine for 5 years, but I do have one beef. Once that lid comes off, it does not work the same. It will always continue to pop off. I ordered a new lid from their website because at the time, I couldn't find this model bin anywhere and it looked like it was discontinued. The space I have needed a narrow can and we couldn't find one like this. Anyhow, the new lid worked great until someone knocked it off during their fit of anger and now we have to keep the lid off because it does not stay on. Very annoying. In general, unless you're being rough, it will work well and last you. Just don't go slamming it open or something that causes the lid to come off. By the way, the replacement lid was almost the same cost as the can! Rated 5 out of 5 by MaryD from Well made, saves space,functional, and looks nice. Locking top is... Well made, saves space,functional, and looks nice. Locking top is a plus for pet parents. Rated 2 out of 5 by Lgal from Constantly moves with the wheels This garbage can comes with wheels on the back. So unless it is pressed up against a wall I wouldn’t recommend it. Every time you press the foot pad, it moves. Rated 4 out of 5 by Mica from It was just what I wanted. It locks so... It was just what I wanted. It locks so well that the dogs had to chew the top off to get in!!! Rated 5 out of 5 by Andy from I got two of these trash cans - one for trash and the other one for recyclables. They fit perfect... I got two of these trash cans - one for trash and the other one for recyclables. They fit perfectly in my storage closet and roll out of the closet to make it easier to empty the trash bags. Rated 5 out of 5 by Della from Great trash can! Works well and looks terrific.... Great trash can! Works well and looks terrific.